The Pandora has an official TV-out cable that can be ordered from DragonBox. The cable works with PAL and NTSC, and has a length of 20cm. 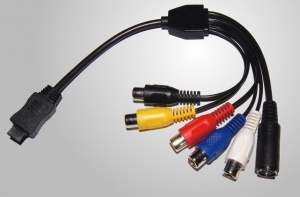 The connection plugs are all female, so a separate cable (either RCA or S-video) of any desired length should be used to connect it to the TV. Although mostly used to duplicate what is on the Pandora's screen, the TV-out is a full secondary graphics output, and is capable of running independently from anything on the LCD. For example, DraStic (the Nintendo DS emulator) supports showing one screen on the Pandora LCD and the second one on the TV - which gives one a similar gameplay to the Wii-U. The blue and black plugs can be used to record audio to the Pandora from an external source (such as from a microphone).